It's not hard to see why this movie is liked by so many. It's different from most other animated movies with its approach and humor and thank goodness it's not one that's aimed just toward young kids. For a movie with such a silly and unlikely premise as this one has, it's actually a surprising subtle movie. It's subtle with both its storytelling and comedy, in the sense that it's not constantly all in your face with everything. The comedy doesn't get forced upon you, with constant screaming and other loud noises and characters jumping around and crashing into random stuff. It's more subtle than that, with its dialog, character expressions and unexpected things happening in the background or at the end of a shot. It all feels far more creative than just the average genre attempt and it's also definitely less generic. 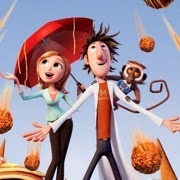 The movie is truly simply doing its own thing and in some ways it feels more like an old school cartoon with slapstick comedy in it than a modern computer animated movie. The story is actually a very simple and straightforward one but perhaps that's also why it works out so very well. There are hardly any distractions in the movie its story. So no annoying side plots that aren't going anywhere or pointless secondary characters, who are just there to fill the screen. But also no other formulaic ingredients, such as a mustache twirling villain, that wants to take over- or destroy the world. The premise of the movie is very simple and it stays that way at all times but not without being without heart as well. It's an emotionally effective movie, due to its cute and likable characters and it's silly but yet a the same time very recognizable situations. It's never a movie that's trying to be a hyper-realistic one. As a matter of fact, it loves to exaggerate with just about everything. It's a very colorful and typical cartoon-like looking movie, with also some very cartoon-like looking characters in it. Characters that are extremely small, characters that are extremely buff or fat, characters with big noises, characters with big eyes, crazy hair, crazy eyebrows and basically everything in between! It's a great and very fun look, that truly suits the story and its circumstances very well. It's also good to see an animated movie that isn't trying to impress with its voice cast for a change. The movie doesn't feature the biggest or most well known names and I truly believe that all of the actors got cast simply because their voices suited the parts very well and not because their names would look good on the posters and other advertisements. I basically had a great time watching this movie. It's genuinely fun, funny, cute and creative, despite of its very simplistic and ridicules sounding concept.